We all work hard to drive as much traffic as possible to our sites, but what about once they arrive? Are you doing all you can to convert that hard earned traffic into a satisfied customer? What would a 1% improvement in conversion rate mean to your company's bottom line? FusionBot's faceted search is a powerful search & navigation tool for converting more visitors into customers, by more effectively connecting your visitors with the most relevant items they are looking for, regardless of the keywords searched or spelling used, improving your conversion rates and reducing your cost of customer acquisition. FusionBot utilizes powerful ranking algorithms to provide pinpoint precision coupled with millisecond response times. Why settle for anything less? Your visitors wouldn't and neither does your competition. Add Faceted navigation (refinements) to your search results and category pages* without affecting SEO. Create filters (refinements) dynamically, based on any product attribute, such as price, color, and brand. Millisecond search response times. Synonym keyword matching. Spell-check / Did you Mean? search logic Word Stemming Automated SEO Keyword links Unparalleled service and support. *For category integration a small setup fee may apply. Excellent app. We have had great reviews and comments from customers on our search function on the website. Searching our website is much simpler now. 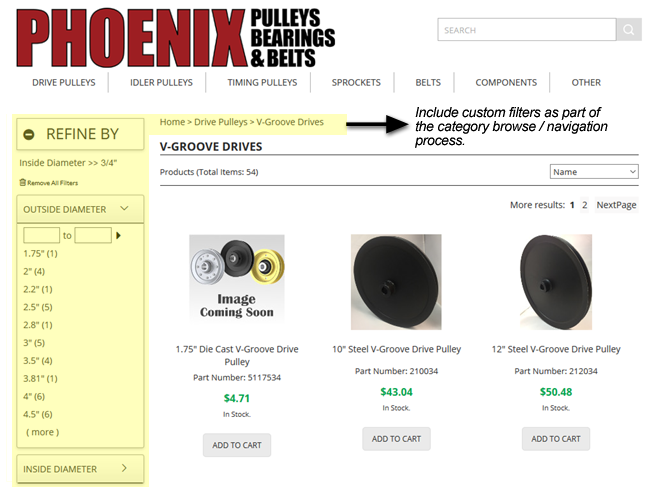 We have been told that our website is very user friendly and they are able to find parts quick and easily using the search bar. We have been using this app for over 2 years now and could not be happier. Def recommend and great customer service. Amazing custom site search. Extremely flexible. Fusionbot always responds to our requests immediately. Great service and great search results. Terrific search engine. 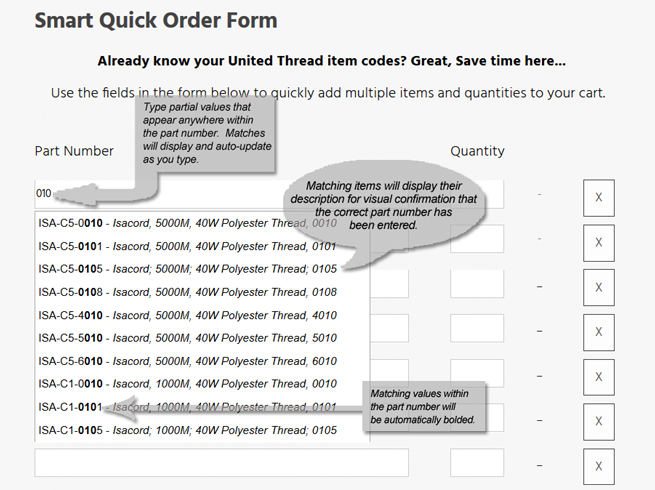 We have over 18K products on our site and Fusionbot has really helped us organize our data for our customers. The support from FusionBot is outstanding. Our manufacturers have comprehensive rules with regard to what we can and can not show and sell online. FusionBot was able to customize our search to adhere to the myriad of rules our manufacturers place on us. If you need anything custom they can do it. Highly recommend this company. 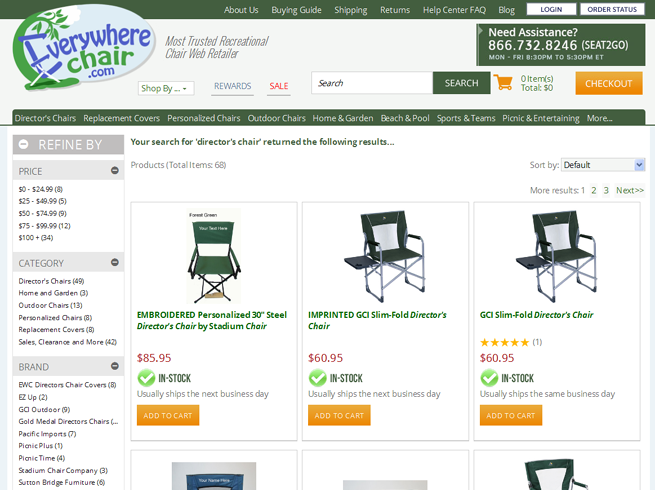 In moving our website platform to 3d Cart, I wanted to find a full featured faceted search that would truly help my customers narrow down their search for just the right chair. And one that would not break the bank. I found it in FusionBot. Customer service has been extremely responsive, creative and focused. Together we have implemented an database driven search function on my website that is exactly what I wanted. Kudos to John and his team for building and supporting a great search solution. Having a robust search on your site is impotent. FusioNBot helped our on-site performance and conversion. The FusioNBot team was there to help along the way with the setup and integration. Our original site search returned too many results which confused customers. Fusionbot search allows the customer to narrow down the search results and find more accurate information. Awesome search integration that is much needed and highly recommended! FusionBot did everything we asked for and more. We asked for some fairly complicated implementations and they took on the challenge and succeeded. Highly recommend. We had a Gentleman names John S. that helped us get FusionBot integrated to our new website. Extremely professional and knowledgeable who went above and beyond to give great service. Fusionbot works perfectly as well and looks clean. Good Job Team. Adding Fusionbot to our 3dCart store has been one of the best upgrades I can imagine. John was incredible to work with. He bent over backwards to make sure that our implementation to our stores template was flawless. Couldn't be happier with his responsive and helpful attitude. But what really shines is the results. Having dynamic search capability is really helpful. There's no comparison between the out-of-the-box search function of 3dCart and what Fusionbot delivers. Give it a try. You won't be disappointed. We're thrilled with our decision to use FusionBot for dynamic search on one of our 3dcart hosted ecommerce stores. FusionBot is a 1000x improvement on the default search functionality. The excellent service alone is worth our monthly subscription fee. John, our FusionBot led us through the implementation process with true expertise, patience and encouragement. The FusionBot products; including a robust, seamless, optimizable site search and product filtering, make the value unbeatable. We've only had FusionBot turned-on for a month, and as I watch visitor recordings I'm seeing a clear improvement in UX, search effectiveness, and customer journey on RecycleAway.com. Thanks FusionBot for a fantastic product, excellent value and impeccable customer service. Prior to using FusionBot our search feature was horrible. You had to write the exact phrase in order to get any matches! Other search engine companies were asking for an arm, a leg, and our first born child. As a small businesses we needed our appendages and peeps which is why we turned to FusionBot. Don't let the low cost fool you, they have Ritz Carlton customer service and a great product. I am very happy with what FusioNBot was able to do with our website and would recommend this app to anyone! We recently migrated from an old platform to 3dCart and tapped FusioNBot to integrate their search and filtering functionality. 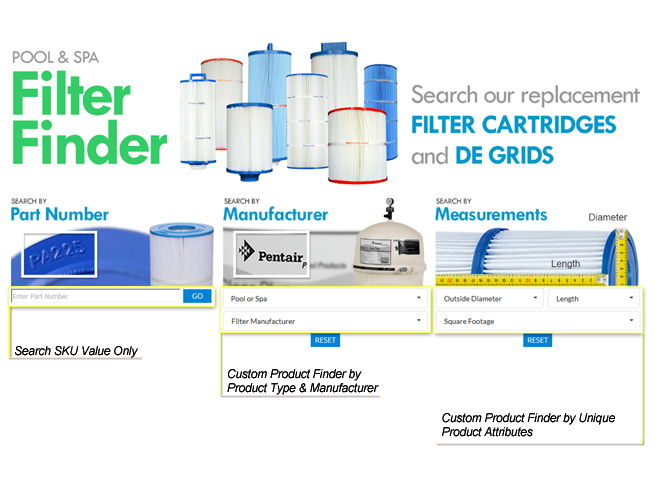 Our customers need the ability to search through our products using many different filters. FusioNBot was able to accommodate all of our major requests for filtering including adding new functionality. Also visually the filtering looks wonderful! My rep was outstanding to work with and super responsive to all of my dozens of questions and requests before, during and after implementation. They also gave me an estimate upfront of the implementation and they stayed on budget. Highly recommend!! We have been using FusioNBot search for a little over a year now and could not be happier with the service or the results. FusioNBot handles our 400,000+ products without a glitch. Here's what we really like about it: - John Sortino quickly integrated the search into our site and required very little input from us. It was painless! - FusioNBot cleanly blends with the look and feel of our website. - We are always adding new products and deleting obsolete ones, and FusioNBot quickly updates so our search is always in sync with the products on our site. - Search speed before FusioNBot was 5 seconds plus. With FusioNBot, searches take a fraction of a second. 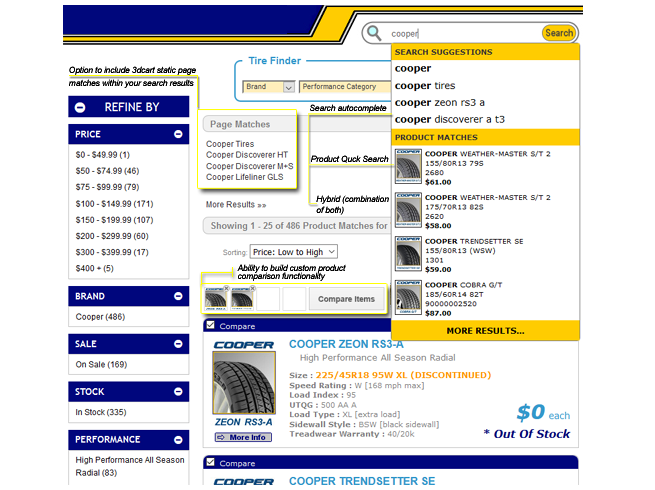 - Customers love the preliminary results that appear just below the search bar, complete with thumbnail image and price. - Filtering is very useful. Overall, FusioNBot helps our customers find items quickly and efficiently. It also helps us find items fast when assisting customers. FusioNBot has been a great investment. Give it a try! As most of you know 3dcarts search feature is not the best. I found this out on several occasions over the years from customers who would say something like Your site is great but your Search is awful I went back and forth for over a year considering a 3 party alternative. I saw FusioNBot and decided to give them a try. First of all, you need to know when you deal with FusionBot you deal directly with the owner, not a salesman. Second of all, he does not give up, I was not easy on him due to how customization I required. He finally tweaked it just the way I want it and I have to say that I am very pleased. I received the email below from one of my customers this morning. For the price and service, FusionBot is the one to go with. "Easy search results and quality products." Working with John Sortino and FusionBot was a true pleasure, which I can't say for most companies that we hire to do a project for us. Probably one of the best experiences we've had working with any person/company. Not only was the FusionBot search feature that was added to our website perfect, it was more than what we had originally envisioned thanks to John's knowledgeable advice, input and patience. John and the other folks at FusionBot know their business and get the job done on time. Needless to say, I would highly recommend FusionBot to anyone looking for the products and services they provide. Couldn't be more happy! John and his team were great to work with. He was fast with communication, giving us detailed responses to nuanced and complex questions, and never hesitated to jump on a call with us. We are looking forward to seeing how the expanded search and filtering will help our customers and improve our website's performance. Extremely Satisfied with the Functionality of FusionBot. It takes your site to the next level. Excellent Customer Service!! Thank you Fusionbot!